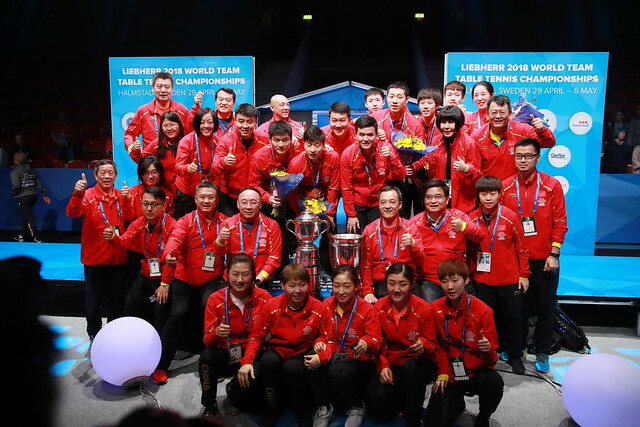 Tuesday 1st May is a day of great importance for the top female players at the Liebherr 2018 World Team Table Tennis Championships in Halmstad as the Women's Championship Division group stage officially draws to a close while the Men's Championship Division plays out its penultimate round of group encounters. Seeded fourth and fifth respectively and with both teams tied on points at the summit of Group D, the fixture between Hong Kong and Korea Republic carries significant importance. The two sides met in the group stage of the 2016 World Team Championships in Kuala Lumpur where Hong Kong came out on top by a 3-1 score-line but could we be set to witness a different outcome in Halmstad? China is closing in on securing first position in Group A following perfect outings in the opening three rounds of group fixtures but life for the defending champions may be about to get a little more tricky: awaiting China on the morning of day three is a meeting with 2010 World champions Singapore with the host nation Sweden providing the opposition later in the day. Looking to keep their hopes of qualification alive, Romania could be under the cosh in Group C: the European champions may require a big performance against one of Chinese Taipei or DPR Korea if they are going to reach the main draw as Netherlands and Poland are still in with a shot of overtaking the no.6 seeds. Japan and Chinese Taipei made the Men’s Championship Division headlines for the wrong reasons on day two in Halmstad as both teams suffered unexpected defeats to England. Now the two Asian sides, seeded third and sixth respectively, are set to battle it out in what could be a play-off for the runner up spot in Group C while group leaders England attempts to make it four wins in a row with a positive result against Singapore. Apart from a massive scare against Egypt on the opening day of play, top seeds Germany have been simply sublime in Group A but could their unbeaten run be about to come to an end? Dimitrij Ovtcharov and Co. will need to put in a strong showing on day three to prevent that from happening with Wong Chun Ting’s Hong Kong next up for Team Germany. Commonwealth Games champions, but India’s hopes of reaching the next round in Halmstad are currently under threat – can they earn a much needed win against Croatia to stay in the hunt for Group D qualification or will the likes of Sharath Kamal Achanta and Sathiyan Ganansekaran be condemned to another defeat? Watch the action unfold live from Halmstad with itTV.